If you know me -- or if you're one of the three people who follow this commentary-ridden chronicle I call a blog -- you know that when I was younger, I was an enormous bookworm. On any given day at any given moment throughout most of the 90s, chances are you'd find me with my nose buried in the pages of a paperback novel. 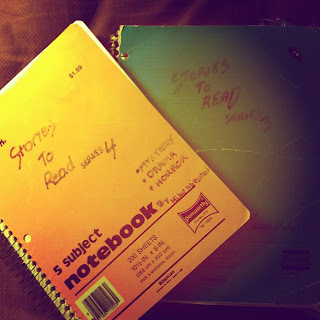 What I may have also briefly mentioned in past posts is that, from the ages of 9 to 12, I filled up five 5-subject notebooks with short stories I wrote. 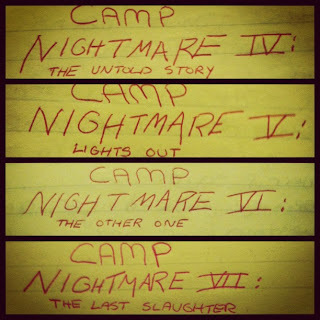 Most of these stories were heavily influenced by the genre that fascinated me: horror. While spending one Saturday night in my L.A. bedroom watching old episodes of Felicity (jealous? ), I dug out three of these notebooks that I had brought back with me from my childhood bedroom in New York. Flipping through the fading wide-ruled sheets, I realized several things: 1) I was a total ripoff artist -- but isn't that the nature of a child writer, to mimic what you see, learn and enjoy? 2) I was all about creating my own title fonts. 3) My descriptive skills weren't the best and 4) I absolutely loved coming up with names for my characters. 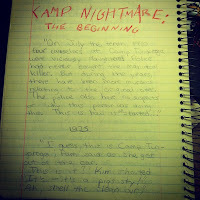 Above on your left (click on it to zoom in) is the prequel of a Friday the 13th-esque series I created called Camp Nightmare. 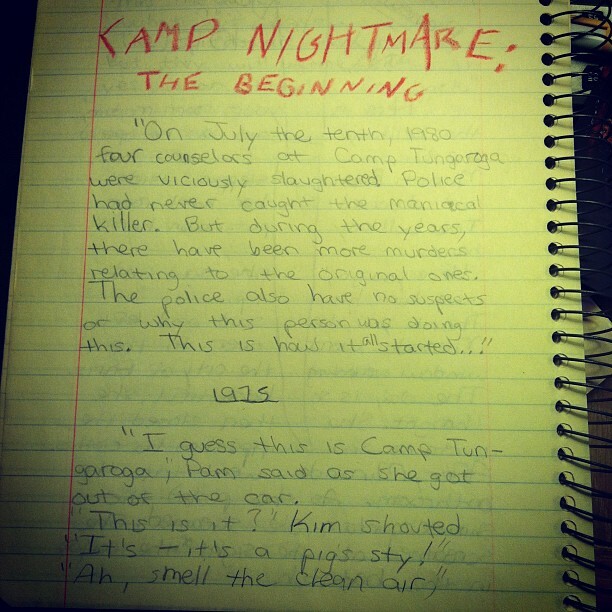 From what I remember after revisiting my scribble, it was about an unidentifiable killer who chops up teenagers in the woods near a place called Camp Tungaroga, a summer destination with a gruesome history (something about a boy who went berserk after finding out his girlfriend cheated on him). After enjoying writing eight installments (you can see some of those titles below), I thought it'd be a great idea to do a prequel -- did I even know what that was? -- and write an origin story. 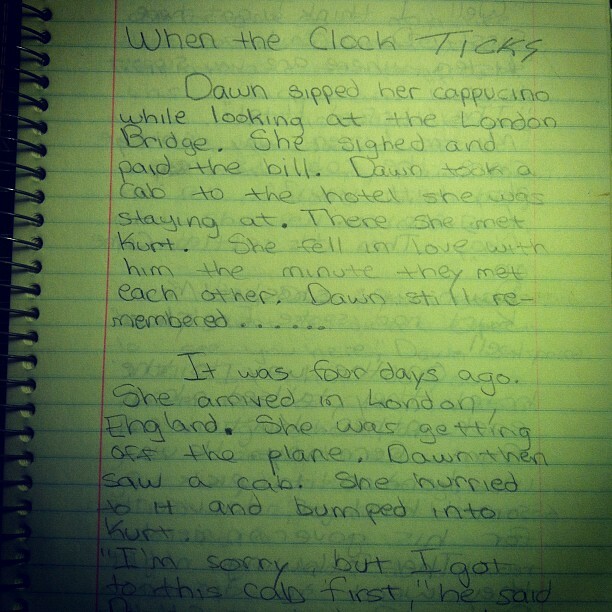 Pretty impressive for an 11-year old in 1991. And surprise! I didn't have a lot of friends back then. Then, on your right, you'll see my first attempt at a spy thriller. It was called When The Clock Ticks. 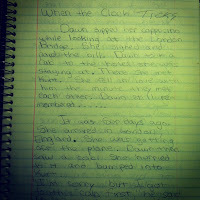 (I thought the title was pretty cool back then.) Loaded with romance, international intrigue, and danger, it took place in London and starred a woman named Dawn who, if I remember correctly, falls for a man who's involved in some obscure conspiracy. All within the span of 12 pages! As for my other stories, there was my Halloween series, surrounding the bloody exploits of mass murderer "Fred Michaels." 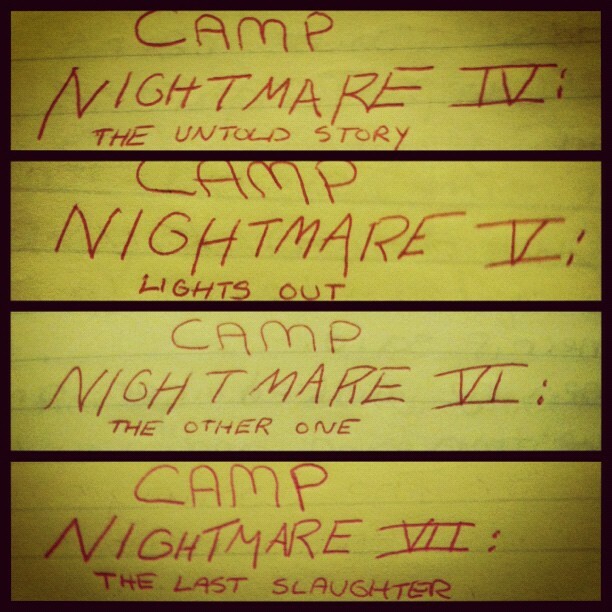 My Frightmare franchise, which was clearly inspired by all of the Nightmare of Elm Street movies I caught on TV, dealt with some deadly dreams. And then there were countless other titles: Westkill (young people get butchered at a ranch during a horseback riding weekend), Alone in the Dark parts I-III, My Vicious Valentine, Forest Lake (an all-star murder mystery that takes place at a cabin in the woods), The Great Quake, Hurricane, 2015: Year of the Meteor (I was really into disaster flicks too), The Mysterious Locket, The Evil (a haunted house series which ran for 8 installments) Whodunit Hotel (an idea I actually might turn into a television pilot, now that I think of it), an "epic" thriller called The Halloween Conspiracy, and the post-apocalyptic The Sound of Dying Birds, a tale about an old man and a little boy who share a park bench amidst devastation and watch birds fall from the sky (mind you, this was 15 years before Cormac McCarthy published The Road). "I have found that the impulse to write, to record one's private feelings, often appears at a very early age; with few exceptions, most authors started writing in childhood. If as a child you gravitated towards books and kept diaries or made up stories, it speaks to an inherent aptitude for language...The child writer may be intensely verbal or intensely withdrawn. One thing is certain: his urge to write things down is predicated by the need to validate his experience. The child who makes sense of his world, escapes or remakes it through reading and writing, may never find another home as welcoming." Some of my childhood memories involve me sitting at a table, pencil in hand, scribbling away for an entire Saturday afternoon. When I look back at those moments, I remember how much I was consumed by the act of writing...and reading (I once tore through R.L. Stine's The Babysitter in one sitting). The outside world didn't exist. All I had and needed was a notebook, a pencil, and an urge to create. As lonely as it sounded, it was all I knew. In hindsight, I wouldn't have had it any other way. I am now able to fully appreciate and understand that so much of what I did, what I wrote, and what I read back then informs who I am today. And with that, I give my thanks to the horror and mystery novelists, the screenwriters, and the filmmakers who left an impression on a little boy from New Rochelle, New York and inspired him to inspire others.